Per his military service record (regimental no. 4905), Ernest Stephen Taylour was born at London, England. He gave his age as 37 years and 8 months, his marital status as married, and his occupation as labourer. His description on his medical was height 5 feet 3 inches tall, weight 134 lbs., with a dark complexion, brown eyes, and black hair. His religious denomination was Church of England. He claimed to have no previous military service. He completed his medical on the 11th November 1915 at Parramatta, and was attested at Parramatta on the 11th November 1915. The Coo-ees had held a recruiting meeting in the Park at Parramatta on the evening of the 10th November, where it was reported that 41 men had offered themselves as recruits. After completing the Coo-ee March he went to Liverpool Camp as reinforcement for the 13th Battalion. His service record shows he was made Acting Sergeant on 11th November 1915. He was reported in The Farmer and Settler on 5th January 1916 as being one of the Platoon Sergeants in E company from the “Coo-ees” column, and it was noted that ‘as the “Coo-ees” are reinforcements for a battalion already at the front, and not part of a new battalion, these ranks may be only temporary’. On his embarkation roll his address at time of enrolment was Farndon, Prospect Road, Wentworthville, N.S.W., and his next of kin is listed his wife, Mrs M. [Miriam] Taylour, Farndon, Prospect Road, Wentworthville, N.S.W. On 8th March 1916 Acting Sergeant Taylour departed Sydney on the HMAT A15 Star of England, along with many of the other Coo-ees, as part of the 15th reinforcements for the 13th Battalion. He arrived in Egypt on 11th April 1916. On 19th April 1916 he transferred to the 45th Battalion in Egypt. 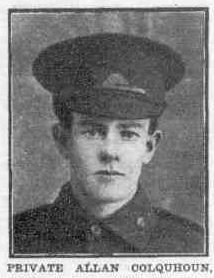 On 2nd June 1916 Private Taylour left Alexandria aboard the transport Kinfauns Castle bound for France, arriving at Marseilles on 8th June 1916. On 7th August 1916 the 45th Battalion was in the front lines in the vicinity of Pozieres, France, when Private Taylour was evacuated from the field suffering shell shock. He was moved back to the 3rd Casualty Clearing Station, then on 8th August 1916 he was moved to the 13th General Hospital at Boulogne, France. On 9th August 1916 he was placed aboard the hospital ship Jan Breydel for evacuation to England. On 10th August 1916 he was admitted to the St Lukes War Hospital at Halifax, England. On 9th October 1916 Private Taylour was discharged from hospital and marched into the Number 2 Command Depot at Weymouth, England. On 2nd November 1916 he was transferred to the Number 4 Command Depot at Wareham, England. On 12th April 1917 Private Taylour marched out to Number 2 Base Depot at Weymouth. On 4th May 1917 Private Taylour departed Devonport, England, aboard H.M.A.T. Runic bound for Australia. He arrived in Australia on 6th July 1917, and was discharged Medically Unfit on 14th August 1917. Per his military service record (regimental no. 4749), Allan Colquhoun was born at Glebe, Sydney, N.S.W. He gave his age as 18 years and 4 months, his marital status as single, and his occupation as saddler. His description on his medical was height 5 feet 4 ¾ inches tall, weight 104 ½ lbs., with a fair complexion, blue eyes, and light brown hair. His religious denomination was Church of England. He claimed that he had 4 years military service in the cadets. He completed his medical on the 10th November 1915 at Parramatta, and was attested at Parramatta on the 11th November 1915. The Coo-ees had held a recruiting meeting in the Park at Parramatta on the evening of the 10th November, where it was reported that 41 men had offered themselves as recruits. On his embarkation roll his address at time of enrolment was Redmont [sic, i.e. Belmont] Street, Merrylands, N.S.W., and his next of kin is listed as his aunt, M. Colquhoun, Redmont Street, Merrylands, N.S.W. On 8th March 1916 Private Colquhoun departed Sydney on the HMAT A15 Star of England, along with many of the other Coo-ees, as part of the 15th reinforcements for the 13th Battalion. He arrived in Egypt on 11th April 1916. On 11th May he was admitted to hospital at Tel El Kebir, Egypt, suffering from Influenza. He was discharged on 5th June 1916. On 6th August 1916 Private Colquhoun left Alexandria aboard the Transport Megantic bound for England. On 23rd September 1916 Private Colquhoun departed England bound for France. He arrived at the 4th Australian Division Base Depot at Etaples on 24th September 1916. On 21st of October 1916 Private Colquhoun marched into the 13th Battalion when it was in billets at Steenvoorde, Belgium. On 1st January 1917 the 13th Battalion was at a Brigade Sports day at Rainneville, France when Private Colquhoun was admitted to the 4th Australian Field Ambulance suffering a dog bite. He rejoined the 13th Battalion on 7th January 1917 when it was leaving its billets at Ribemont, France. On 23rd February 1917 the 13th Battalion was training at Ribemont, France, when Private Colquhoun was admitted to the 3rd Australian Field Ambulance suffering a hernia. He was transferred to the 4th Division Rest Station on 27th February 2017. He rejoined the 13th Battalion on 6th March 1917 at Ribemont, France. On 11th April 1917 the 13th Battalion was involved in an attack on the Hindenburg Line in the vicinity of the village of Reincourt, France. During this attack the Battalion suffered 25 killed, 118 wounded, and 367 missing. Private Colquhoun was one of those reported missing in action. On 23rd June 1917 the German authorities reported that Private Colquhoun was a Prisoner of War and was being held at Limburg, Germany. On 1st December 1918 Private Colquhoun was repatriated to England. He was admitted to the 1st Australian Auxiliary Hospital at Harefield, England. On 13th December 1918 he was granted leave to report back to the hospital on 4th January 1919. On 5th March 1919 Private Colquhoun departed England aboard the transport Nevesa bound for Australia. He arrived in Sydney on 26th April 1919, and was discharged Termination of Period of Enlistment on 10th June 1919.